> Day 4: 5, 12-06 (20, 64-14) Reed stuck with his simple Carolina rig strategy today in Lake Eustis, but he sensed the population of fish inhabiting the shell beds he kept visiting was starting to dwindle. Still, he was thrilled to collect his best finish in a tour-level event since he placed 4th at the Clarks Hills Elite Series back in May 2010. With the slight change in weather, the fish started biting differently. To counter that, he resorted to a shaky-head to catch two of his weigh fish. “I think they got tired of me and it didn’t replenish last night and the cupboard just went dry,” he added. The top-5 is so far the highlight of his first year competing on the FLW Tour after more than a decade on the Elite Series and Bassmaster Tour. He stepped away from the Elite Series in the middle of the 2016 season, but feels rejuvenated now. “Personally, things are in a much better place now,” he said. “My mind is in a much better place. At (Lake) Travis two weeks ago, I didn’t get paid and finished a pound out of the money. But practice at Travis felt right. Things fell into place. Everything was going good and even after Travis, I felt like I was getting the tires back on the road. Day 3: 5, 18-10 (15, 52-0Reed is taking a cautiously optimistic approach into the final day. His stringers have increased in weight each day while Cox’s and Lehew’s continue to shrink. He said the fishing was considerably tougher this morning, but he remained committed to the area that’s produced each day for him. 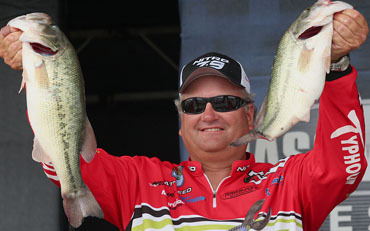 Those 4 1/2-pounders came off a spot where he caught a 5 1/2-pounder Friday. He has several other spots within the area that have been key as well. Hard bottom out in the middle of the lake is how he described the area he’s targeted. He’s anything but nervous entering the final day. Before the tournament started, Reed was convinced the winning fish were going to come from off-shore schools. His thinking appears to be spot-on so far. He worked “a bunch” of deeper-water spots to catch his weight. His bag was anchored by a 5-03 brute and his smallest fish was 4 pounds. Matt Reed stuck with his deep-water plan and it paid off. “I felt like if I caught them, I’d have a big weight, but it’s scary as crud trying to catch one,” he said. “You don’t know if you can catch them. You know if you do, they’re going to be good ones. Patience is a huge factor this week, especially with the community holes taking a beating.